We’re very pleased to share our initial proposal for the NuCypher network’s staking economics along with a call for community feedback (paper) (spreadsheet). Nodes are compensated in both inflation (NU tokens) and fees paid by users (ETH). This proposal only attempts to address inflation compensation dynamics. Economic design is one of the most important attributes of a decentralized network, on par with its consensus protocol and governance mechanism. It provides the incentive structure that ensures individual actors behaving out of self-interest take actions that are beneficial to the network. As such, we have and will continue to invest considerable time and resources to analyze the optimal economic design NuCypher prior to its mainnet launch. While economic design for decentralized networks is a nascent field that remains more art than science, we’ve examined the economic parameters of other networks in an attempt to learn from their experience. This has helped us design incentive mechanisms, inflation schedules, staking locks, and slashing conditions. For NuCypher, it’s important to incentive nodes to provide re-encryption services. This means high availability (nodes are consistently online) and long-term service (in order to support long-lived access policies). Short-term staking should also be encouraged and compensated, albeit at a lower rate. The paper addresses each of these desired properties, calculates expected miner compensation, and devises optimal mining/staking strategies. 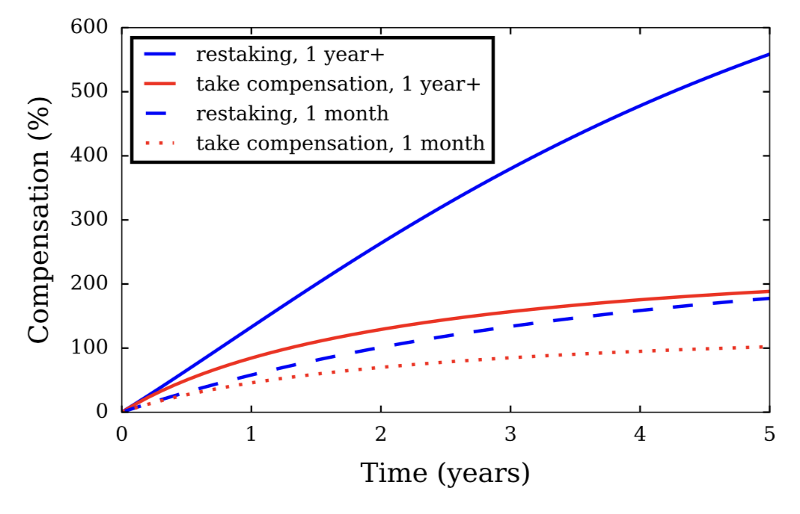 Inflation compensation under various staking strategies. It proposes a mechanism similar to that of other networks, in which miners are initially subsidized via an inflation schedule that decays over time as fees increase along with network adoption. It also proposes differential compensation rates based on the length of time one commits to staking, which is a key requirement to ensure adequate network capacity for long-lived access policies. 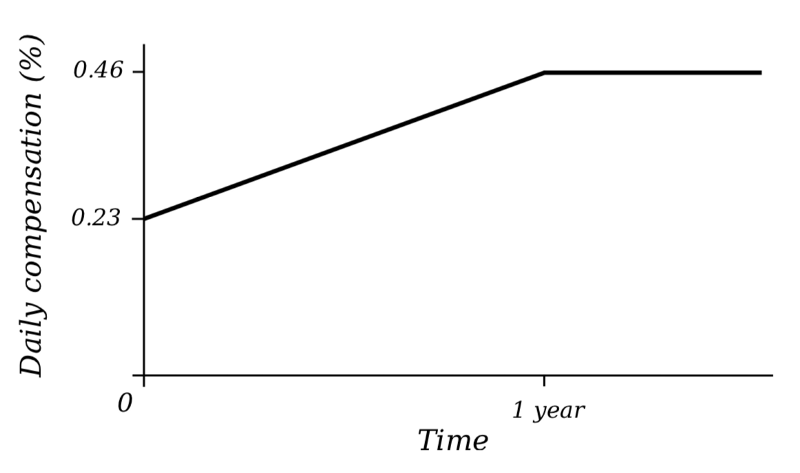 Inflation compensation rates increase the longer a node commits to staking, with the maximum rate occurring for 1+ year commitments. We’re also releasing a (simplified) spreadsheet which models the inflation dynamics described in the paper so that it’s easier for readers to get a sense for the impact different parameters have. We’re very interested in community feedback in advance of finalizing these parameters so please don’t hesitate to open an issue on Github, or message us on Discord with your thoughts.